You are planning to hold a birthday party? A wedding anniversary ceremony? A housewarming party? A baby shower? You would like to organize a family gathering?… And you feel overwhelmed by the preparations? 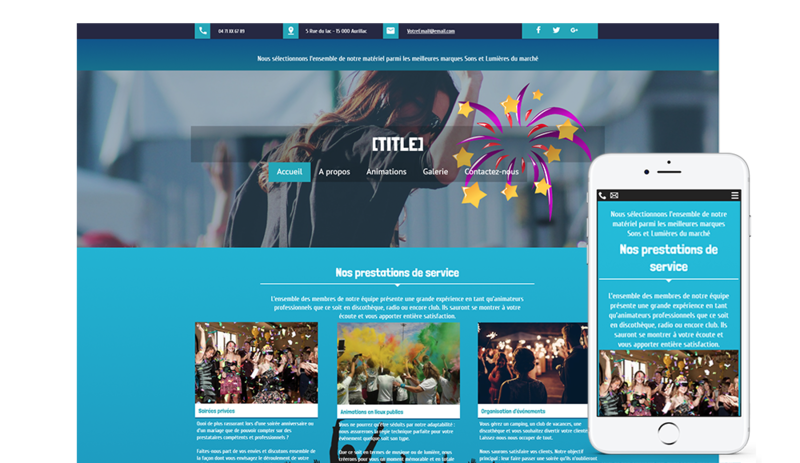 Have you thought of creating an event website? We often think of starting a blog for big events like weddings, but creating a website can also help you prepare smaller personal events like birthdays or anniversaries. Here are a few pieces of advice to help you organize with an event website design. Your website can function as an online invitation card. It is up to you to create a pretty and welcoming website layout, and above all, a web design that you like. SiteW puts at your disposal a large number of tools allowing you to customize every detail of your event website appearance. You can base your website design on one of our free predefined templates. All our models are fully customizable. Then you can use the various web design features to change the colors, the fonts, the pictures, the web page backgrounds, the content areas, the page transition effects... The possibilities of creation are endless! Starting an event blog with SiteW will enable you to display the essential information about your party: date, time, location, of course, but also practical elements that will make life easier for everyone, like, for example, a Google Map. But you will also be able to easily indicate your contact information or to add the route description, using a Download block, and you will have the possibility to highlight some specific information (“Come dressed up!”, “Bring something to eat or drink” or even “Don’t forget your bathing suit!”), by using the page layout tools of your choice (Box block, Icon block...). Eventually, you will be able to add fun and/or useful gadgets such as a countdown timer, or even a weather widget so that your guests can dress accordingly. The main benefit of creating an event website is the interactive aspect: adding a reply form to your website will enable you to easily estimate the number of your guests. This way, you should certainly get quicker responses: your relatives and friends will just need a click to tell if they come to your party or not. You will also have the possibility to insert a contact form so that your friends and family can easily send you a message directly through your event website. You can add a forum too and thus generate an exchange of ideas, comments and suggestions. You will also have the possibility to add your videos to your website, as well as audio recordings or even music (broadcast of a speech or a sketch, playlists), if needed. Share your stories and memories, using a guestbook or a forum: everyone can, in a participative way, share their anecdotes, their experience and their feelings about the party. Thus you will create a space for exchanges, that is full of life and dynamism and in which everyone can participate. SiteW allows you to choose whom you share the content of your website with: you only have to enable the page protection option and select the member or password access mode, or even disable search engine indexing. Thus, if you don’t want your family memories to be exposed on the web, you can limit the access to your website content to only certain users. With SiteW, you are the one who decide who can access the pages of your event website. To conclude, creating a website for a birthday party, an anniversary ceremony, a housewarming party, a family gathering or any kind of small personal events can really help you organize your party. In addition, it adds a creative, practical and interactive aspect. Not forgetting the friendly side and the unifying aspect of it: exchange of personal stories, photos, memories… All in all, creating an event website can be a good way to organize, to express yourself, to exchange with others and get closer to each other!